FINCA provides entrepreneurs in developing countries and emerging markets with a range of critical financial products and services. We deliver our work through a social investment partnership and a global network of subsidiaries in 20 countries. 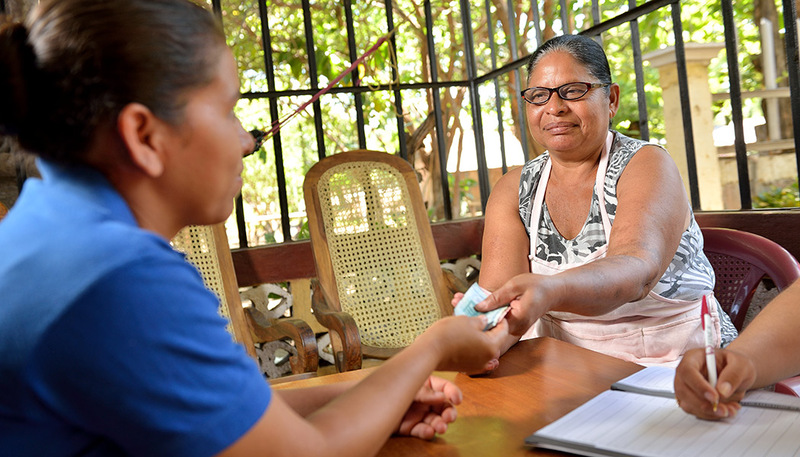 FINCA’s Village Banking and small group loans are targeted to very low-income entrepreneurs with the smallest enterprises, where group members—who otherwise lack collateral to pledge—can provide a guarantee for each other’s loans. These larger loans and more flexible terms help growing entrepreneurs continue to build their businesses and generate jobs. These loans let rural clients purchase seeds, fertilizer, livestock, and equipment when they are needed, and repay the principal when their harvest comes in. Credit, health, disability, and funeral insurance help reduce the financial stress of meeting the expenses of major or unexpected life events. FINCA clients have a safe and affordable way to receive and send money for business and personal purposes, leaving them more time and resources to focus on their growing businesses. FINCA’s BrightLife clients can purchase or lease clean energy and water solutions for use at home, or to improve their small businesses. These products also improve their families’ health and safety by eliminating the use of kerosene or charcoal from their homes. Savings help clients build a cushion against hard times, and plan for a brighter future. They serve as a nest egg for education, medical care, major life milestones, old age, business expansion, and other long-term goals.